Core Business Banking Solution | Automated Systems, Inc. The Insite Business Banking Suite with Remote Capture has all the advantages of the Insite Online Banking solution powered for the corporate client. Make a difference in your corporate client’s bottom line by introducing Insite Business Banking Suite with Remote Capture, an internet banking package with onsite image capture technology. The Insite Business Banking Suite provides 24 hour-a-day convenience, streamlined account administration, and puts automated cash management at the customer’s fingertips. A quick and clean work flow keeps business owners on top of their game. Designed with the small business in mind, Remote Capture allows companies to perform image capture onsite and transmit their items electronically to the Insite Business Banking Suite. Security and protection for the Insite Business Banking Suite is provided by the Insite MultiKey Login Authentication System. With MultiKey, your internet business banking customers will experience a hassle-free secure authentication system that keeps them safe. 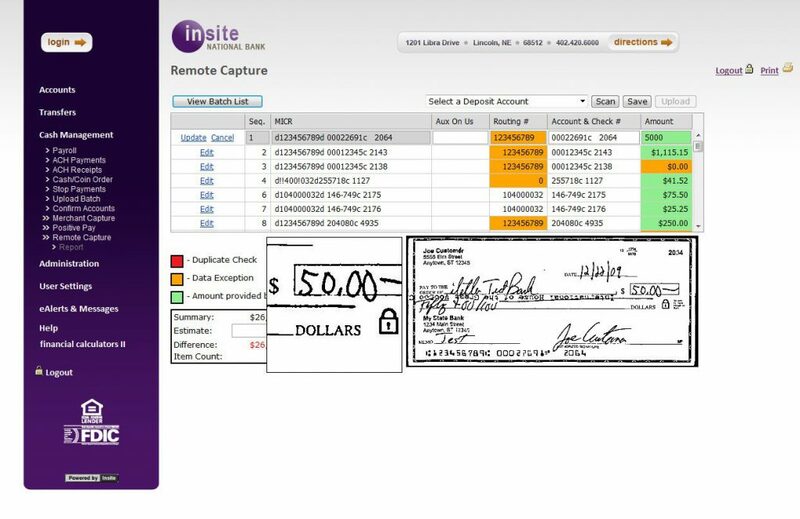 The Insite Business Banking Suite with Remote Capture provides opportunities to increase your fee-based services with less overhead investment. Administration of the Insite Business Banking Suite is flexible and straight forward giving you more time for your customer service.